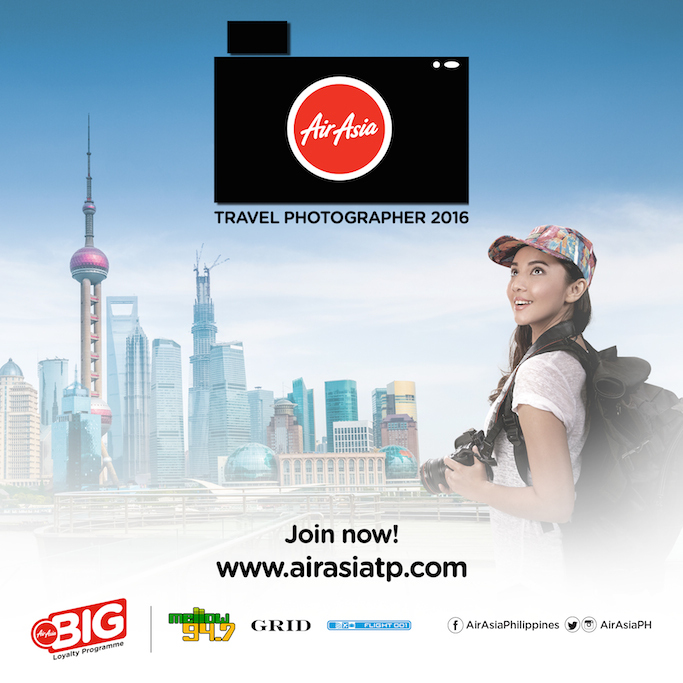 Be the Next AirAsia Travel Photographer! Be the next AirAsia Travel Photographer, and fly one of AirAsia’s exotic destinations and win as much as 200,000 AirAsia BIG Points!!! The top 6 finalists will get a chance to fly to one of AirAsia's exciting destinations to compete in a series of challenges with the winner receiving as much as 200,000 AirAsia BIG Points convertible to flights to any AirAsia destination, a vacation package and a lot of other exciting gifts from our partner brands. Joining is easy. Simply log on to www.airasiatp.com, fill up the form and upload three (3) of your best photographs. 20 semi-finalists will be selected and will be asked to present their works to a panel of judges represented by Nachi Ugarte, Creative Director and co-founder of Grid Magazine; Wawi Navarroza, Artist, Photographer and founder of ThousandfoldPH and Jacob Maentz, American Documentary Photographer from Cebu. The Top 6 contenders will be declared finalists and will be one step closer to becoming the next AirAsia Travel Photographer. They will then fly to an AirAsia destination to compete in a series of challenges that will test their photography and storytelling skills, all leading up to one grand prize winner. Hurry as registration ends on July 31, 2016! For more updates, visit www.airasiatp.com and follow us on Facebook (@AirAsiaPhilippines), Twitter (@AirAsiaPH), and Instagram (@AirAsiaPH). #AirAsiaTP2016. Watch out for the webisodes hosted by Tracy Abad (@tracyabad) of Mellow 94.7, which will premiere this August!